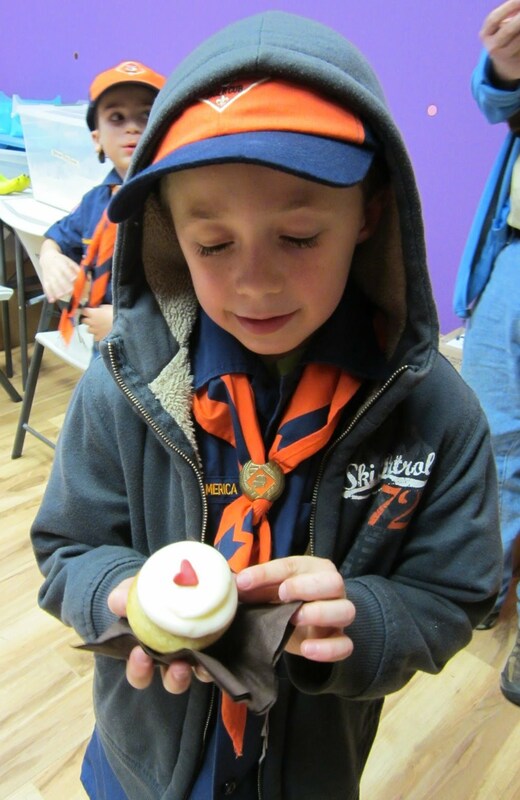 Cub Scouts Visits Frostings Cupcake Bakery. Some of you may remember seeing them on Food Network's Cupcake Wars. They were on the "Wicked" episode. 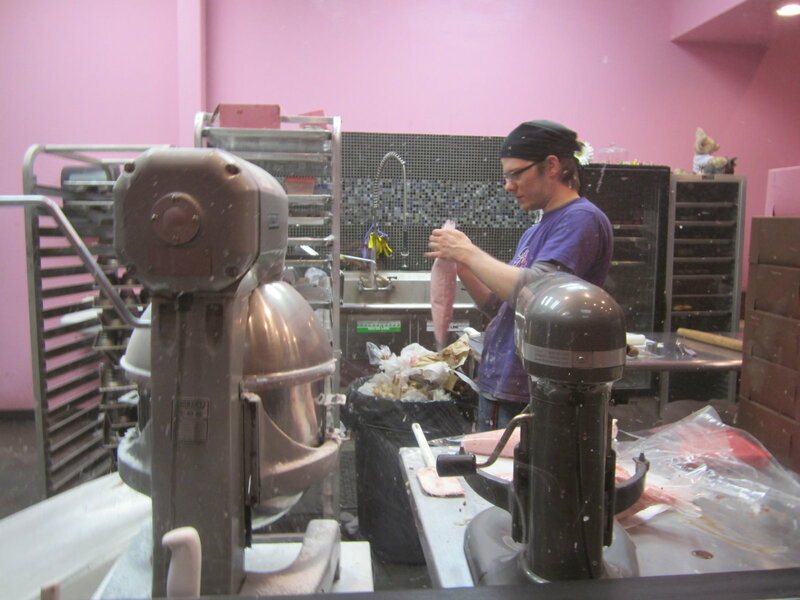 They toured the kitchen and watched the bakers at work. Then they had a Q&A session with the manager. You certainly have to enjoy a cupcake while you are at the cupcake bakery! Filled with delicious cupcakes of course! 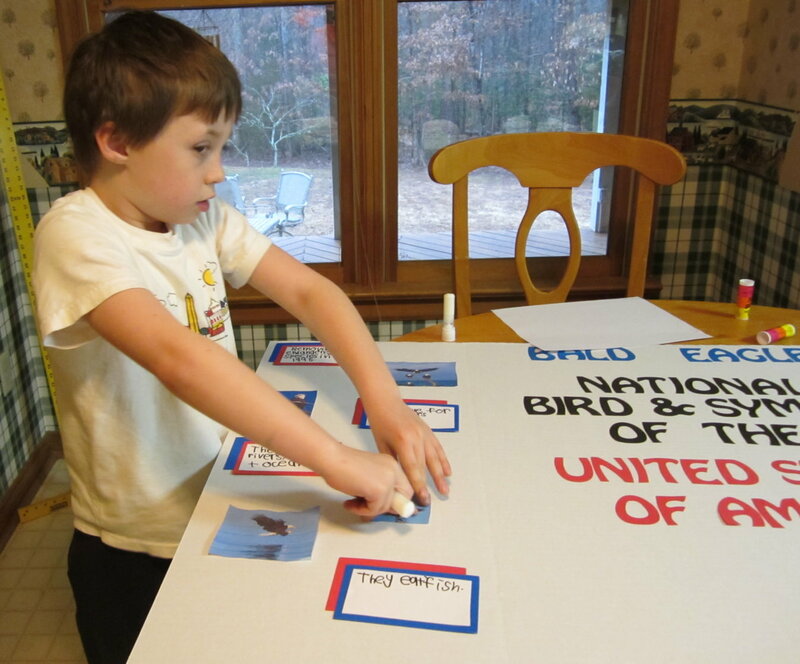 Together we searched the internet for information about the bald eagle. Mike taught us how to use the t-square to get the die cut letters straight on the poster. 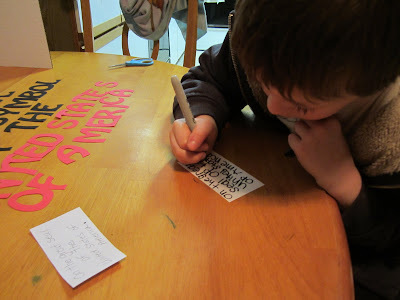 He added the letters, images and his information cards. 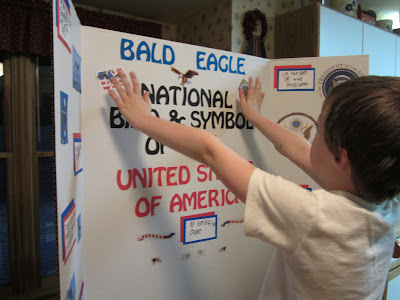 He did such a good job on his bald eagle project! 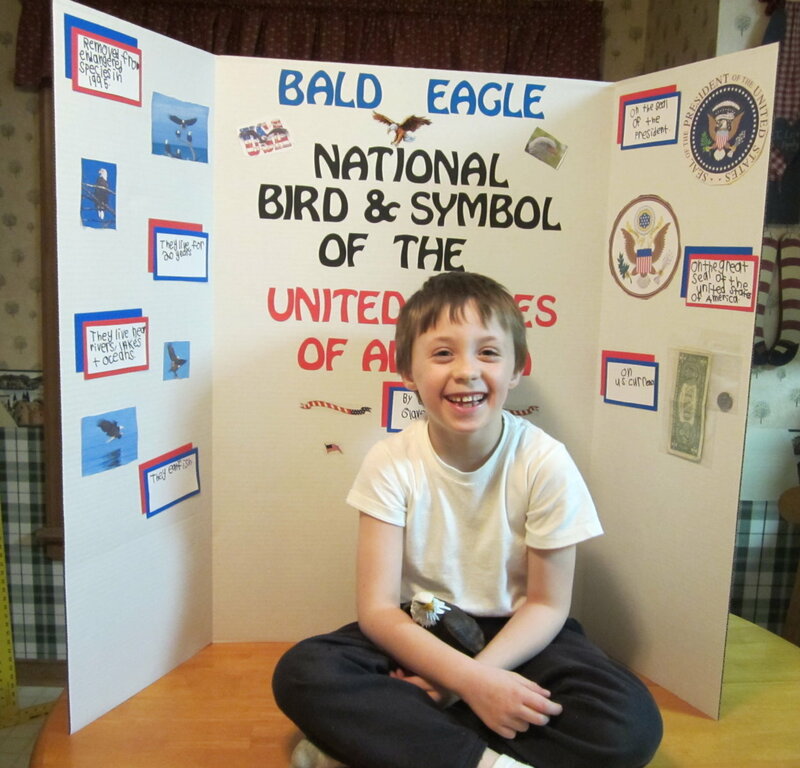 He earned an E for excellent!! Griffin's Cub Scout Pack had their annual Pinewood Derby. Griffin was very excited to have won third place in the Tiger division! Way to go Griffin and Mike ... good job! 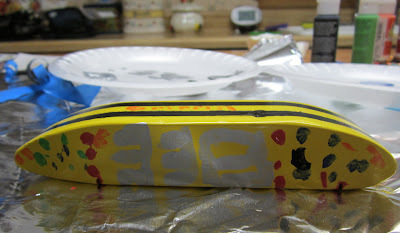 Creating A Pinewood Derby Car. 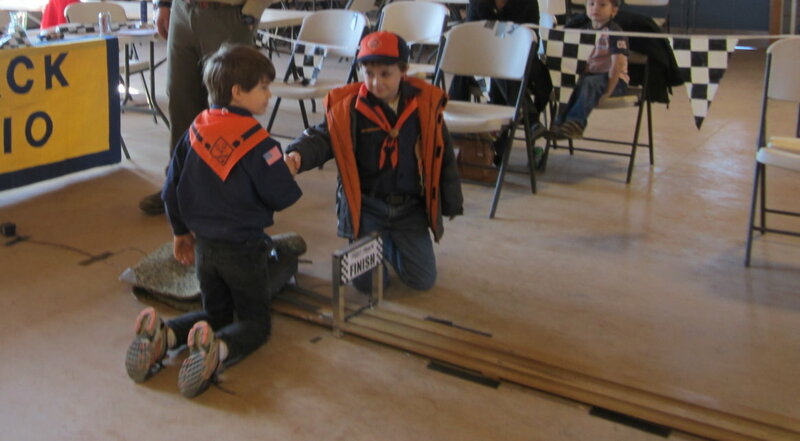 It was Pinewood Derby time for Griffin's Cub Scout Pack so he received his Pinewood Derby Car kit. 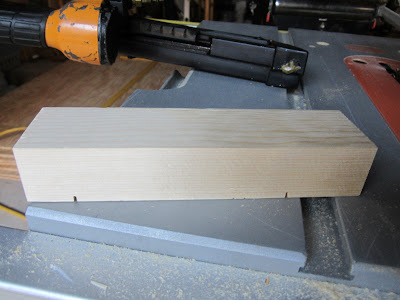 It was a block of wood. This was Griffin's first experience in building a Pinewood Derby car. 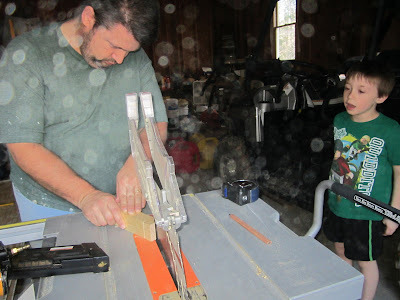 Good thing he has a very talented father and together they could build it together. 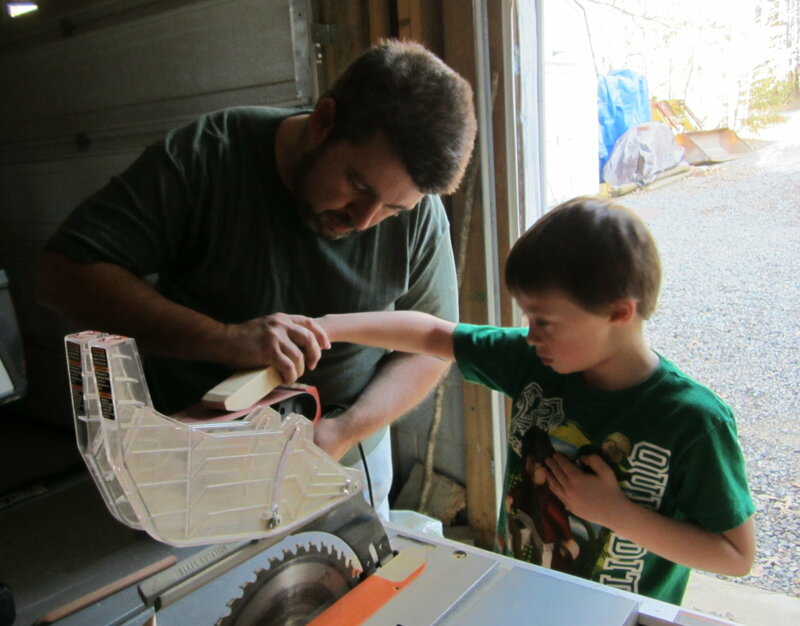 Mike did the cutting on the saw. 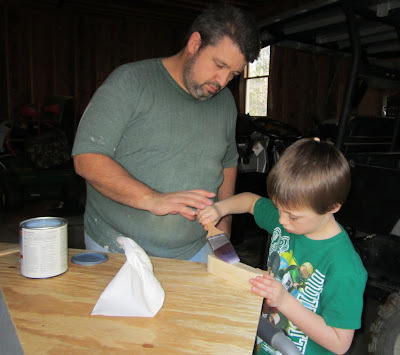 Griffin did the sanding with a little help from Daddy. 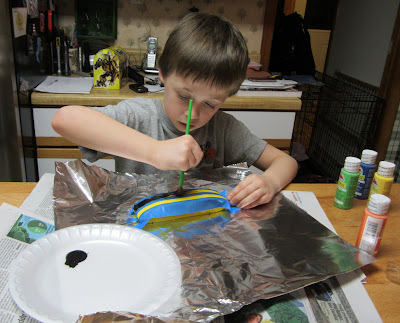 The design was totally his own. 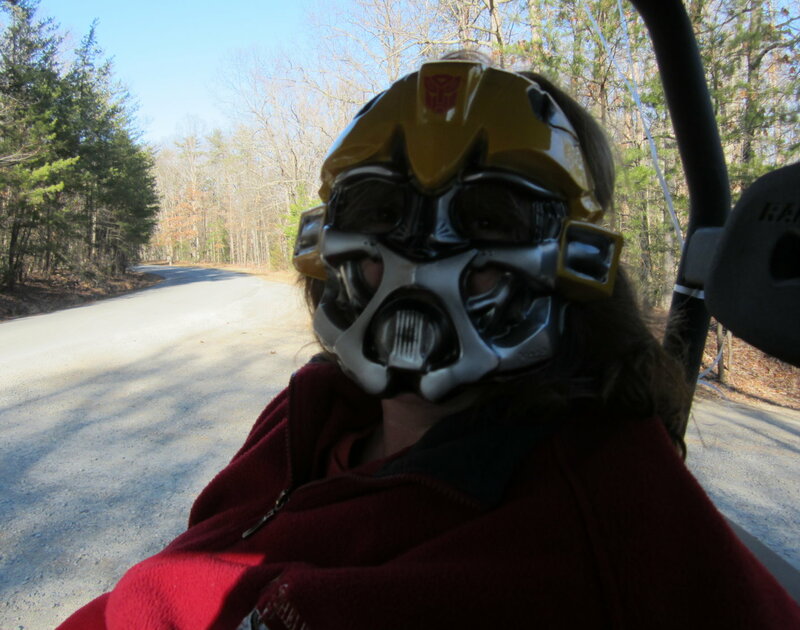 He painted it yellow and with a black stripe like Bumblebee the Transformer. The number he chose is 338 when you flip it over it reads BEE. 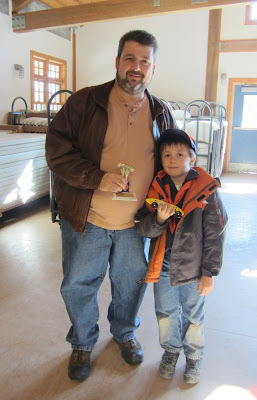 Mike and Griffin had a great time creating his first Pinewood Derby car together. 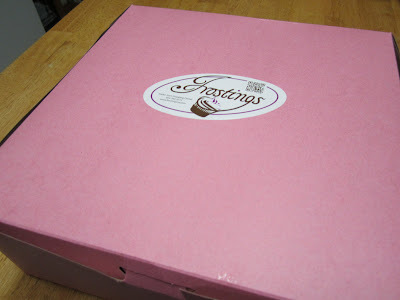 We've had many experiences and adventures the past few months ... it's time to get caught up on my blogging! 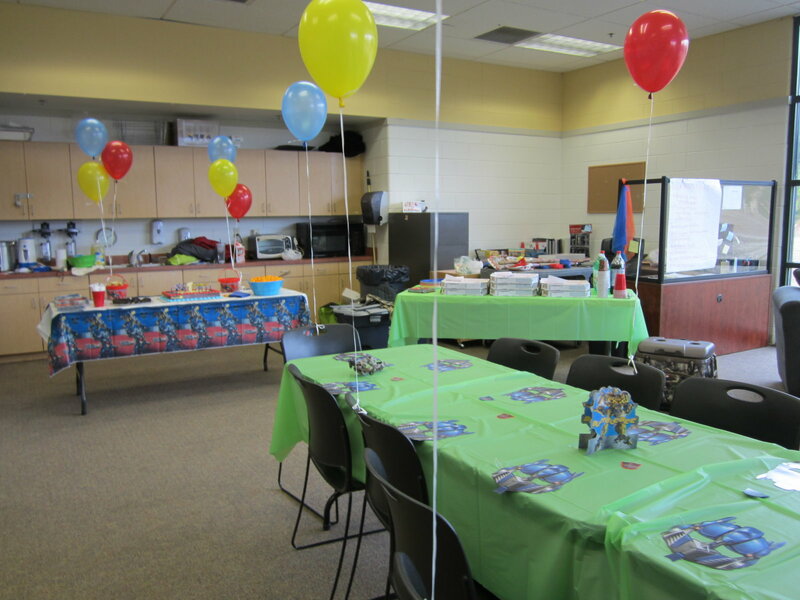 Griffin celebrated his birthday with a party at the YMCA with 20+ friends! When decorating we could choose from red, white or green tableclothes. I wanted to choose the red because it matched better. But, Griffin wanted green. 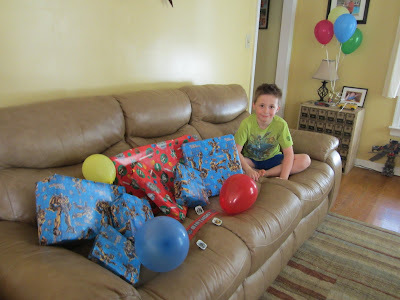 I asked him several times "are you sure" ... and he finally said "Mommy it is a BOY party. It does not have to be pretty it just has to look cool". So ... green it was! The one and only thing he asked for was an Optimus Prime Transformer pinata. Luckily I found one at the party store. 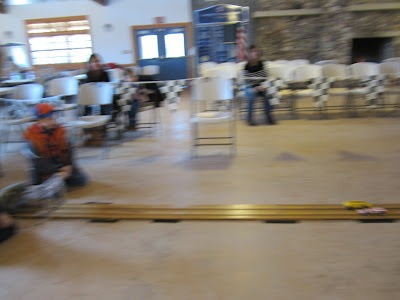 The kids had SO much fun with it. 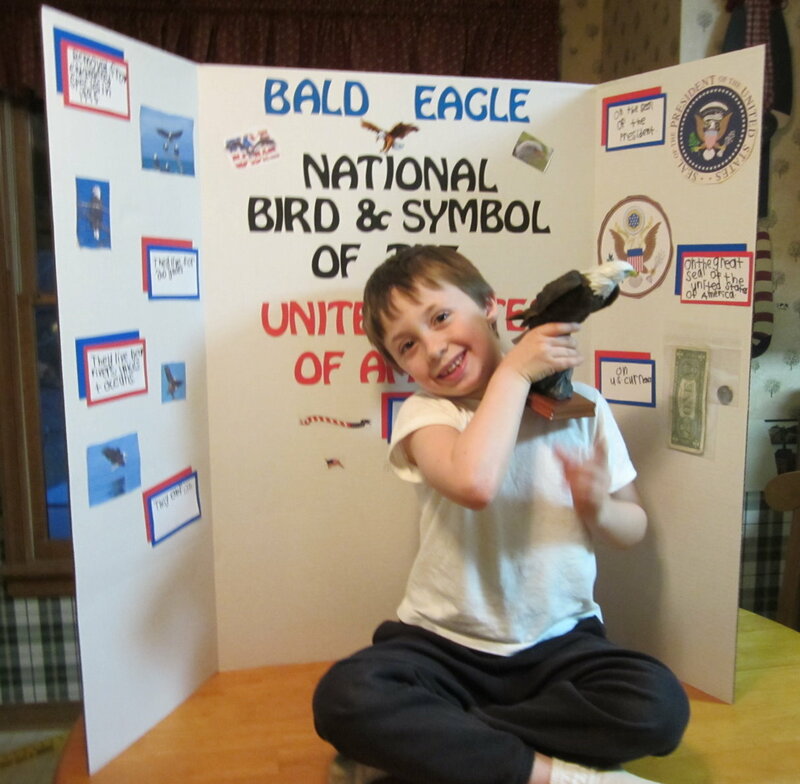 Griffin has a sweet spot in his heart for his good friend Sara. She is so good with him too. She gave him a ride in the deep end of the pool. Though I did not get a picture of it while we were in the pool area ... it snowed. I'm talking big, fluffy blizzard like snow. The kids LOVED it!! 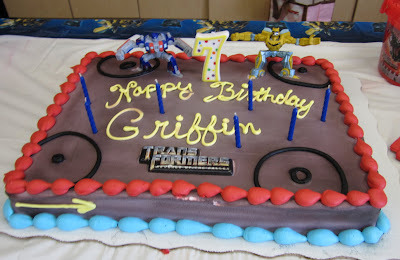 Happy 7th Birthday Griffin ... we LOVE you! 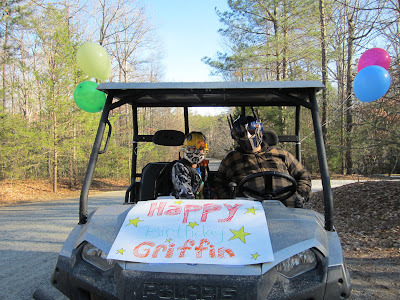 It's been a very big week in 7-year-old Griffin's life! He's achieved so much in just two days! On Monday night he was presented with his Tiger Cub Scout badge. 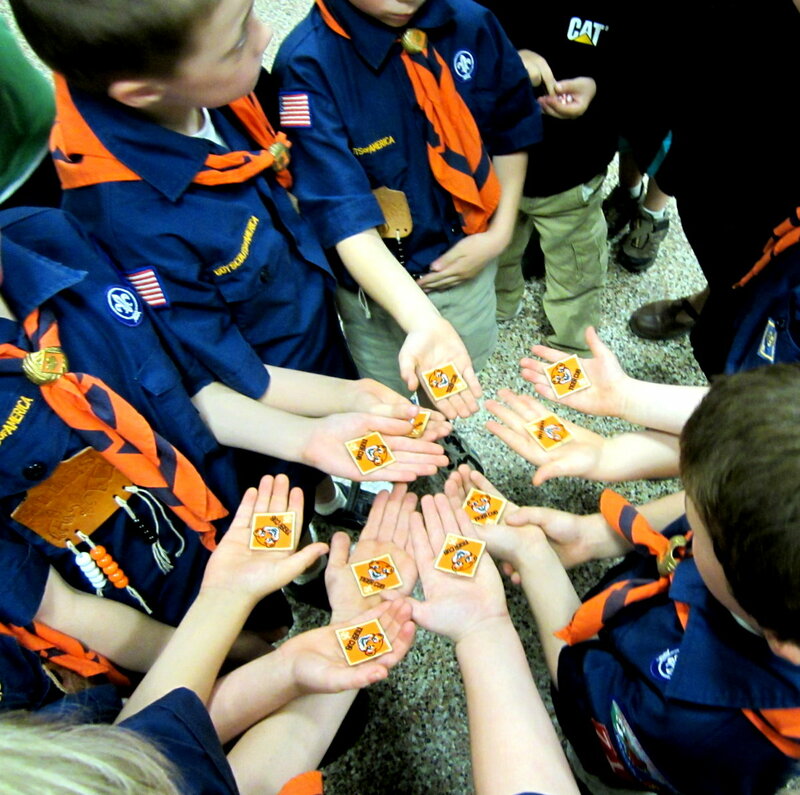 He and all of the other Tigers in his den achieved all of the requirements to earn their Tiger badge. 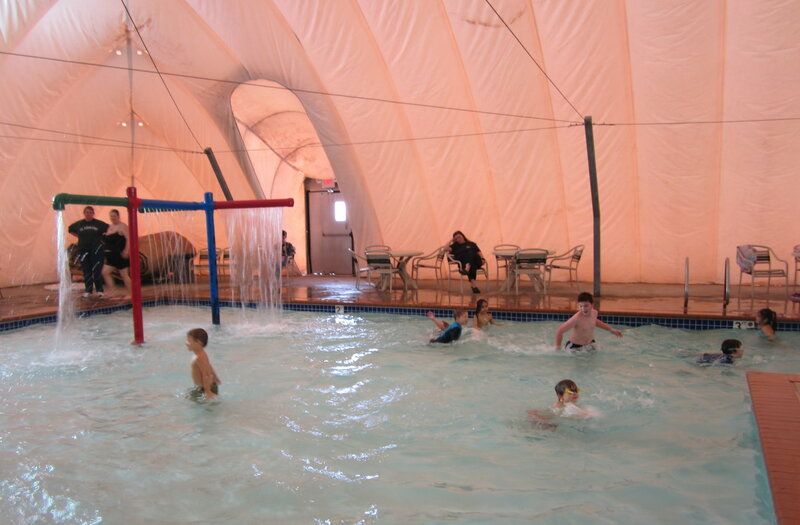 Tuesday after school we went to the YMCA to swim. 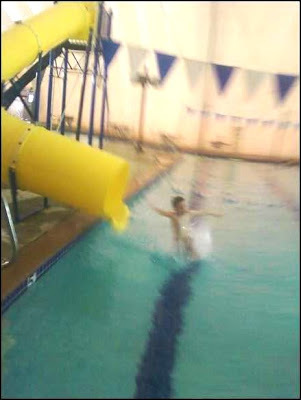 Griffin had mentioned to me he wanted to take the swim test so he could go down the big yellow slide. To pass the swim test you have to swim the full length of the pool and then tread water for 10 seconds without touching bottom. He was very excited to be able to go down the big yellow slide for the first time! And he did it over, and over and over again!! Also, on Monday he got off the bus with a missing front tooth! 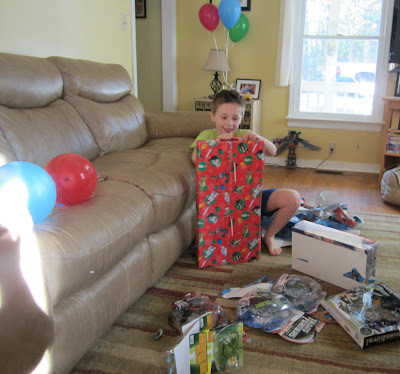 He was super excited about that. He left it under his pillow and the tooth fairy came to visit. 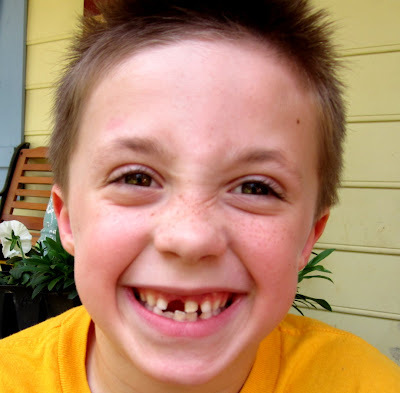 Of course when one front tooth comes out the other is soon to follow. He lost his other front tooth last night right before bed. 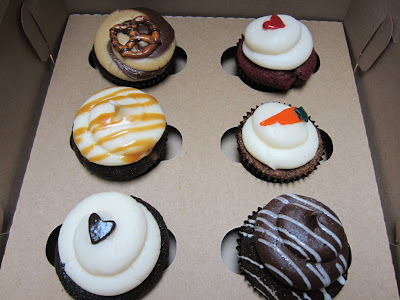 He also put that under his pillow and the tooth fairy once again found our way to her house. We are very proud of all of his achievements and milestones. Way to go buddy ... we love you!! 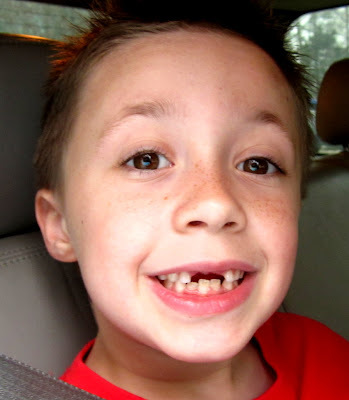 He Lost His Front Tooth. He came home from school today with a missing front tooth. 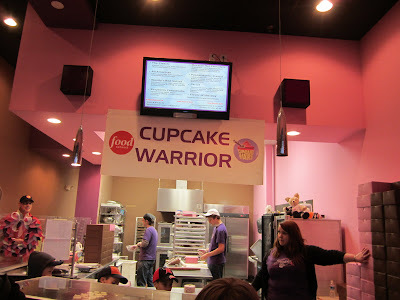 I have so many things I want to blog about ... so many pictures and memories. Just finding the time to blog seems next to impossible these days. Today though ... I have time to post this! 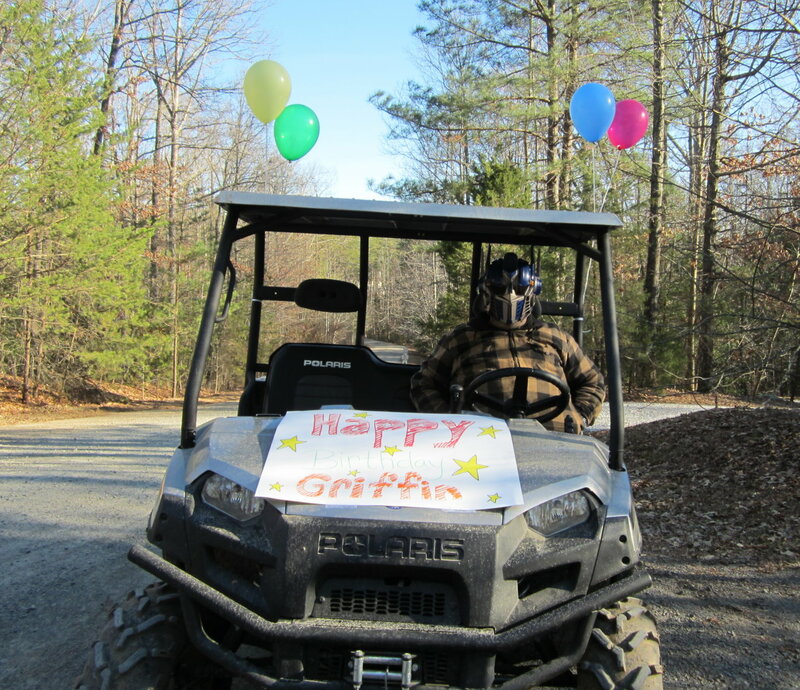 On Griffin's birthday Mike was home and when he is home we always pick Griffin up from the bus stop in the Polaris (the buggy). 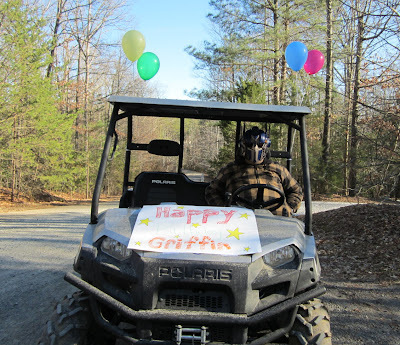 We decorated the buggy with balloons and a Happy Birthday Griffin sign. 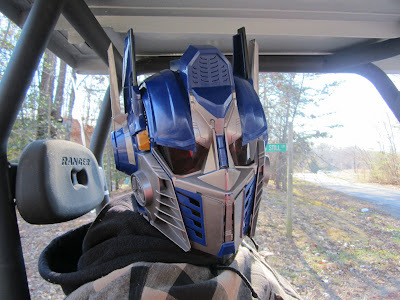 Mike thought it would be funny to go dressed in Griffin's Transformer masks. 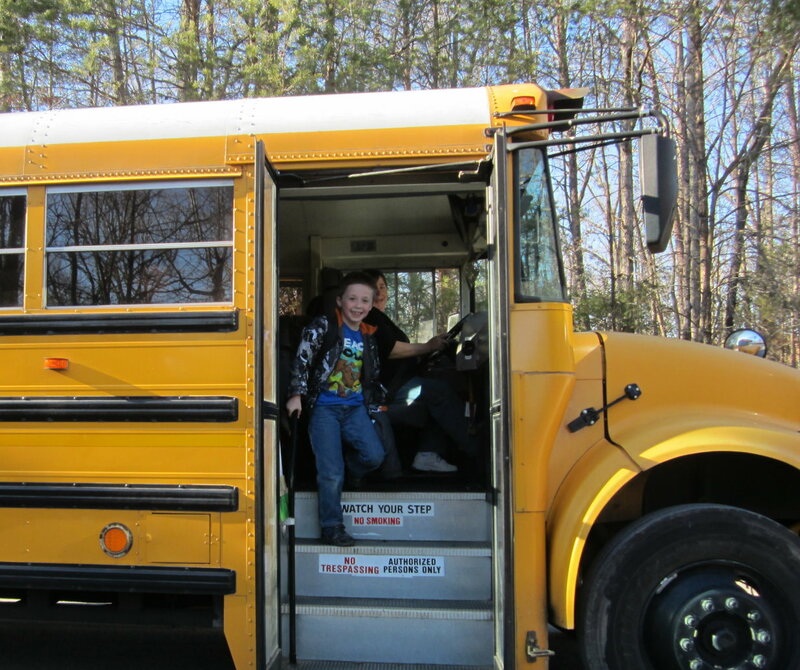 As you can see on his face, Griffin was delighted when he got off the bus. And so Griffin Bee joined Daddy Prime on the buggy for the ride home. Once we arrived home he discovered all of his birthday gifts. 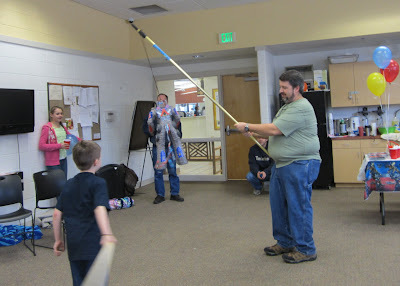 The night of his birthday his Cub Scout den had a go-see-it at the local firestation. I have a number of super cute pictures from that event, unfortunately I feel I should not share the pictures here since I do not have the parents' permission. Just know it was a GREAT time!! Today is the first no school "snow day" for the kids. Griffin and I have been staying warm inside watching movies. 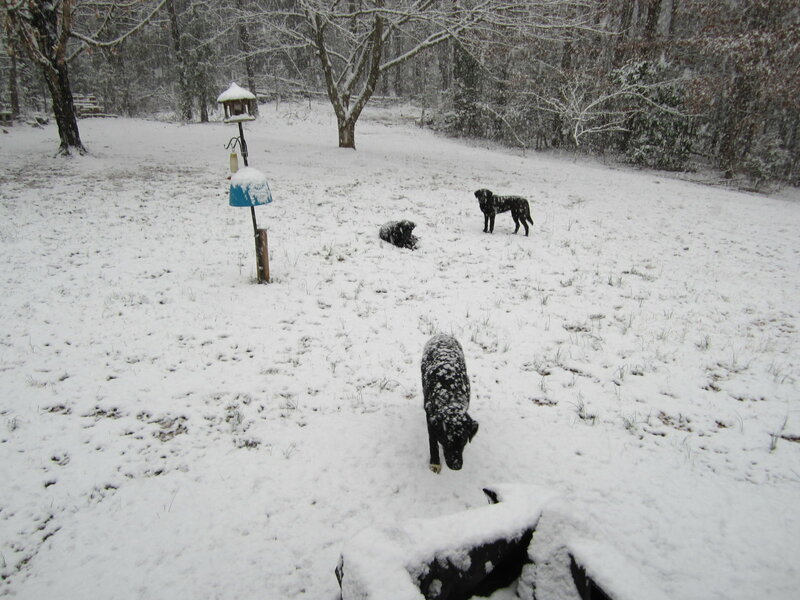 Jasper and Oliver have been having fun outside in the snow playing with Coco. Fun fact about this picture ... I posted it on NBC12's Facebook page and they put it on TV. I didn't see it but a friend told me she did. How cool is that? We are going to snuggle in and enjoy our snow day today.